The Oulmont collection. Drawings, paintings and pastels of the XVIIIth C.
Author : Jérôme Delaplanche et al. Cataloguing, publishing, displaying its collections as much as possible to the largest number of people is one of the major missions of any museum and also allows for unknown works to find their way back into scientific circles as Jérôme Delaplanche reminds us. This can never be repeated often enough. An essential part of the mission also includes preventing works from being forgotten, stolen or destroyed by time. It is especially true for drawings as they cannot be displayed permanently. Thus, we welcome this publication by the museum in Epinal which accompanies an exhibition we have not seen and which studies a graphic ensemble relatively unknown (with a few exceptions) even to specialists. This collection bequeathed by Dr. Paul Oulmont (1849-1917) in 1917 to the museum in Epinal, was in fact put together by his nephew, Charles Oulmont (1883-1984). Even today, this act of generosity essentially constitutes the collection of old drawings belonging to the museum ; the only other two drawings dated before 1800 owned by Epinal  have logically been included in this work which therefore represents the complete catalog of the drawings in the museum, to which have been added the few paintings that were part of the donation. The ensemble consists mainly of drawings of the XVIIIth C., mostly French but also Italian and, a rare phenomenon in France, some English works. For the most part, the Oulmont collection, built up at the beginning of the the XXth C. is therefore still representative of the “Goncourt” taste. As we said, some works were already well-known and had been published, such as the Pietà by Giambattista Tiepolo (cat. 6) ; a red-chalk study by Boucher (cat. 12) ; a Veduta di San Pietro di Castello by Francesco Guardi (cat. 18) ; three drawings by Carmontelle (cat. 25 to 27) ; a Greuze, The Old Housekeper (cat. 31) ; two by Fragonard (cat. 35 and 36) ; another three by Jean-Baptiste Le Prince (cat. 44 to 46, this last being an oil on canvas, Portrait of a young girl) ; a painting by Anne Vallayer-Coster (cat. 60, Portrait of Mme de Béricourt) as well as a small oil on tinplate by Eugenio Lucas, after an engraving from Goya’s Caprichos. But on the whole most of the works were either totally unknown or published only once between 1920 and 1924 by André Philippe in Le Pays Lorrain and Renaissance de l’Art français, which was not enough to make them familiar to the public. Let us note however that Neil Jeffares had included the works in Epinal for his dictionary on pastels . 3. French school, end of the XVIIIth C.
This publication is thus fundamental and indispensable for all art lovers of the French XVIIIth C. May we say in passing that the quality of the edition and the reproductions are highly appreciated. The catalog unearths such interesting works as Study of a woman by Nicolas Lancret, identified here as a preliminary study for the woman on the left in The Morning at the National Gallery in London ; a drawing by François Boucher depicting two lovers tête-à-tête which is part of a considerable group of works by this artist, notably a large mythological composition (ill. 1 ; cat. 15) that has never been displayed ; two drawings by Gabriel de Saint-Aubin (cat. 28 and 29) ; a black chalk work by Greuze (The Sick Man – cat. 32) ; a beautiful child’s portrait by François-Hubert Drouais (cat. 33) ; a red chalk drawing newly attributed to a little known German artist, Friedrich Reclam, and that had until now been thought to be by Hubert Robert (cat. 43), a superb gouache by Jean-Baptiste Mallet, The Visit (ill. 2 ;cat. 75). 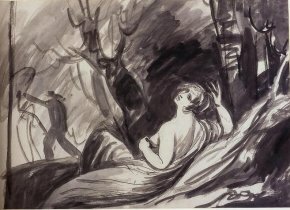 The two drawings by Jean-Jacques de Boissieu (cat. 50 and 51) were familiar to the specialist of this artist but had appeared only in her thesis which is not published . Titania. Study for "A Midsummer Night’s Dream"
One of the drawings for whom the artist has still not been found is particularly remarkable, Portrait of a man belonging to the end of the XVIIIth C. (ill. 3) formerly attributed to Antoine Vestier. Might not the name of François-André Vincent be a possible lead ? His style was so versatile as to be yet clearly defined. Special note should be made as we said of the drawings belonging to the English school. These include a study by Georges Romney for A Midsummer Night’s Dream (ill. 4), a Portrait of a Young Woman by George Chinnery (1774-1852) and a very nice oil on cardboard, Portrait of a Man, tentatively attributed to Richard Parkes Bonington on the basis of the inscription on the back and the style. 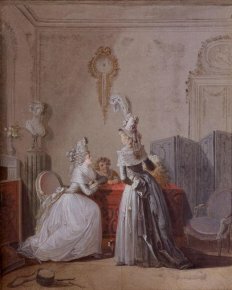 One must not rule out the chance however that it might have been painted by a French Romantic, proof of how close the two schools were in the first half of the XIXth C.
Jérôme Delaplanche and al., Le Goût de la grâce et du joli. La collection Oulmont. Dessins, peintures et pastels du XVIIIe siècle, Musée départemental d’art ancien et contemporain d’Epinal, 2007, 167 p., 28 € (paperbound). ISBN : 978-2-912395-10-8 (paperbound) et 978-2-912395-11-5 (hardcover). 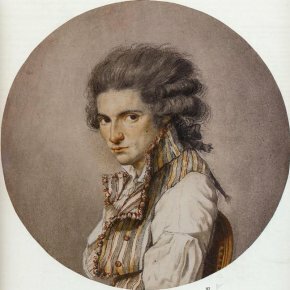 Marie-Félicie Perez, Jean-Jacques de Boissieu (1736-1810), artiste et amateur lyonnais du XVIIIe siècle, Doctorat d’Etat thesis, Université de Lyon II, 1982.